Did you read my last post about safer beauty awareness? The reason the topic of safer beauty even came up was because of a Beautycounter event I attended that gave me the opportunity to try some products for a few days. Thanks Liz for this great post about the #saferbeauty movement and how you can be involved! Recently there has been a sort of craze over being more natural. You’ve probably seen biodegradable, homemade or the all-natural products out there to use in your everyday life. There’s even a craze over paleo diets. All of this is amazing! Not going to lie and say that I don’t use Windex, or eat the occasional frozen pizza, but I like being as natural as possible. I want to improve my well-being; and being more natural in the products I use is a great way to start. Not only is it safer for me, it’s safe for the environment. Free yoga for marathoners (and half marathoners)! Did you run or walk the Houston Marathon or Half last weekend? 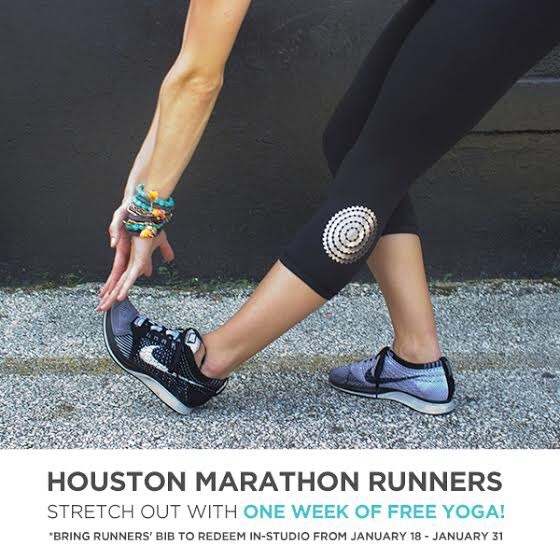 Revolution Studio, a Houston-based boutique fitness studio that offers state-of-the-art indoor cycling and yoga classes, is offering you a free week of yoga! All you have to do is take your bib into any location by Jan. 31 to redeem. Why not reward yourself with the gift of recovery after all that awesome effort? Source: To Return or Not?